The best thing about this dish is you can leave the beef to cook while you go about your day (or if you are using the slow cooker, while you are out at work). Then when you get home there isn’t too much left to do other than a bit of crisping up and salad prep! For a ‘salad’ this may seem a little high in points but this is because the beef brisket itself is a fairly pointy meat. Because this is a salad I wanted the meat portion to be generous so you were left feeling full and satisfied. If you wanted to share the meat portions out further, it would bring the points down a little more. The recipe for the beef below makes 8 portions and when I made this I froze four for another day. The salad as listed below only makes 4 portions (so you can make the meal for 4 or make 2 portions for dinner and 2 for lunch the next day). The beef in this salad would also be amazing in a noodle soup or even some steamed buns so the recipe for both of these will be coming soon! Step 1 – Pre heat the oven to 130c. Step 2- Take a frying pan, spray with 1kal and add the onions. Fry for 3-4 minutes until they start to soften (add a little water if the pan gets dry). Add the garlic and ginger and fry for another minute and then add the beef stock, 1 tbsp honey, the rice wine, dark and light soy sauce and spices. Heat for another minute and then take off the heat. Step 3 – Remove the string from the beef and lie in a large roasting dish (unrolled). Add the sauce from the frying pan. Cover the tin with baking paper then a layer of tin foil so its sealed (this will keep all of the moisture inside the roasting dish). Step 4 – Pop in the oven for 2.5 hours. After this time, uncover the meat, turn it over and baste in the juices. Add the cover back to the meat and pop back in the oven for another 2.5 hours. Step 5 – After 5 hours, remove the beef from the oven and turn the oven up to 180c. Pour the juices from the roasting dish into a frying pan and place onto a high heat. Bubble for 10-15 minutes until the juices reduce by half. Step 6 – Add two ladles of the sauce on top of the beef and drizzle over the rest of the honey. Place the beef back in the oven for 15-20 minutes until the top starts to go nice and crispy. Remove the beef from the oven and shred with two forks. Mix through the rest of the reduced sauce. Step 7 – While the beef is crisping up you can get on with making the salad. Add the salad leaves to a large bowl with the carrot and cucumber. Add half of the spring onions, chilli (if using), coriander and peanuts to the bowl. Dress with the juice of ½ the lime and toss together. Take the other half of the chilli, coriander and peanuts and mix together (you can chop it together into an even finer crumb if you fancy). 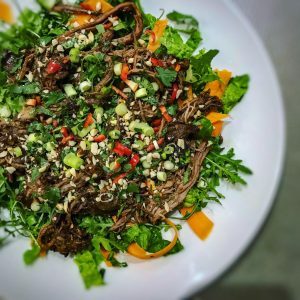 Step 8 – Add the pulled beef to the salad bowl and then top with the mixed ‘crumbs’. Finish by drizzling the beef with the juice of the remaining ½ lime. Fry onions, garlic and ginger in 1kal for five minutes until the onions are soft (add a little water if the pan gets dry). Add the beef, string removed and unrolled, to the slow cooker and add the rest of the beef ingredients (including the fried onion garlic and chilli). Pop the lid on. Cook on low for 8 hours until the beef is soft and easily shreds apart. Once cooked carry on with the recipe from step 5 above, or if you don’t fancy the crispy bits, just shred the beef with two forks inside the sauce in the slow cooker.